Tigers prefer the forests and some tall grass areas of southeast Asia and the Russian Far East . Tigers are predatory carnivores, which means they hunt other animals for food such as deer, pigs, and antelope. Tigers live a solitary life and each has its own territory – a wide area where it lives and hunts. How large can a tiger’s territory be? Scent marking is when tigers use a special mixture of urine and other strong smells to mark their territory. Which type of the following methods do tigers use to scent mark? Tigers have 32 teeth, the same number as most adult humans. A baby tiger is called a kitten. A tiger’s feet are padded, which helps them silently sneak up on the prey they hunt. 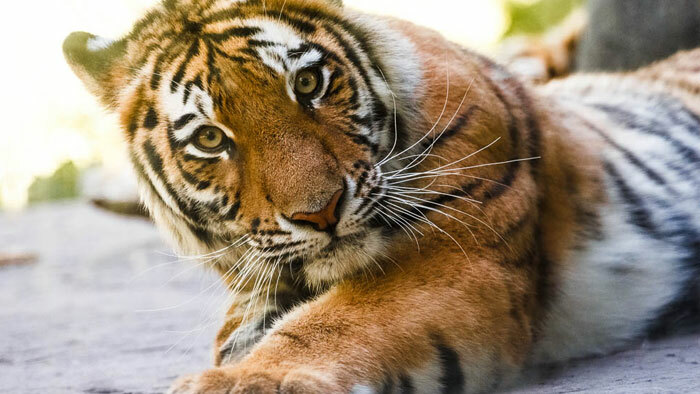 Tigers are the third largest land carnivore in the world, after polar bears and brown bears. Tigers are known for their stripes. Just like our fingerprints, each tiger’s stripe pattern is unique to that individual tiger. Download this activity sheet to find the two identical tigers.